Kid Friendly Condo Ski In/Ski Out to Tahoe Donner Ski Slopes! We bought our 2 bedroom, 1.5 bath condo (sleeps 6) when our twin girls were two years old so they could grow up enjoying mountain life. We designed a kid-friendly condo that would grow as our kids grow, but always be a fun, safe environment for infants, toddlers, and young children. Primarily reserved for family and friends, we rent our second home on a limited basis only, and treat our condo as our second home, because that’s what it truly is! ¨ 50 yards from Tahoe Donner Downhill ski slopes. Considered a kid-friendly ski hill and “The Best Place to Begin”. ¨ Central access to the best ski slopes in the North Lake Tahoe area such as Northstar, Squaw Valley USA, Alpine, Sugarbowl, and Boreal. ¨ Minutes from Historic Truckee, outlet shopping, and fine dining. ¨ Convenient on/off access to I-80 freeway. Don’t fight the traffic coming up from Lake Tahoe! 30 minutes from Lake Tahoe's North Shore. Details: The unit includes 1 car garage, washer/dryer, full kitchen with dishwasher, wood burning stove, electric range & oven, microwave, TV with DVD/VCR, stereo. We have wifi access, but NO CABLE TV. We have a Roku and tons of DVD's, but recommend you bring board games or a deck of cards, and rediscover your family! Sorry, no smoking and no pets. You provide your own sheets and towels. **NOTE: Renters have access via guest cards to all the amenities offered by the TahoeDonner Association. Additional per usage fee required for guests. However, the common area clubhouse across our street has recently been restricted to OWNERS only, so we are no longer able to provide access to the HOA clubhouse across the street from our condo. We are sorry for the inconvenience. We living in the Bay Area of Northern California. We are a family of five with three young kids. We bought this as a vacation home to create memories with our young kids. 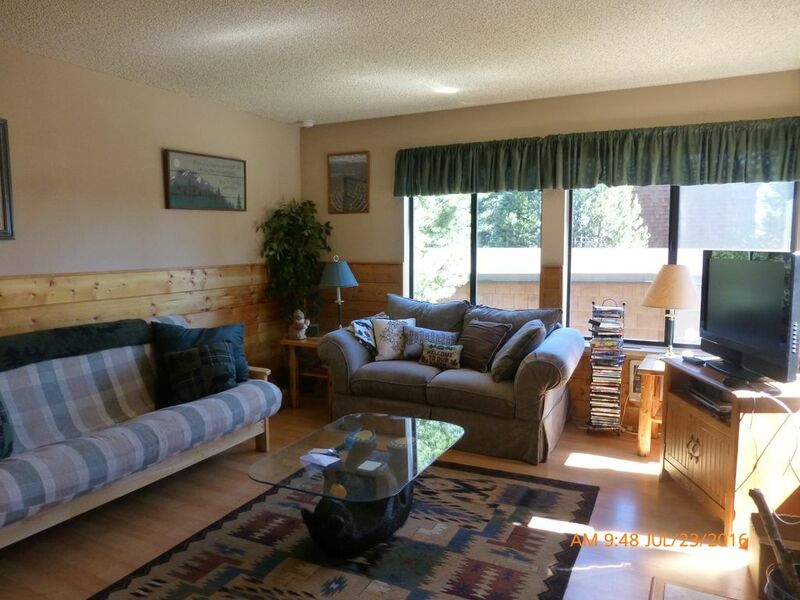 Walking distance to the TahoeDonner Ski Hill! 2 minute walk to Tahoe Donner Ski Slopes! Room heaters in each room. Living room can get chilly in the winter, so bring sweaters and blankets! Washing machine in the condo. Kitchen remodeled in 2013. Fully stocked kitchen -- pots, pans, utensils. Various selection of family-themed DVD's and videos. Available with guest fee at Donner Lake. Walk to the Tahoe Donner Ski Hill! Bring the kids back for an afternoon nap without having to drive! Walk back for lunch in your own kitchen and save from buying expensive lodge food! Available with guest fee. Tahoe Donner golf course five minutes from condo. Access to a sauna maintained by Tahoe Donner Association at the Trout Creek Recreation Center. Guest fee required. NOTE: The SkiBowl Condo HOA maintains a private member only pool across the street from the condo, but restricts access to owners only. Renters of our unit do NOT have access to this pool. Access to three pools maintained by TahoeDonner Association at the Northwoods Clubhouse (seasonal) and Trout Creek Recreation Center (seasonal). Guest fee required. Access to hot tubs maintained by TahoeDonner Association at the Northwoods Clubhouse (seasonal) and Trout Creek Recreation Center (seasonal). Guest fee required. This is our mountain home -- it's not a five-star hotel! Be prepared to fend for yourselves a bit, and be ready to be in a true home, not a hotel. But what we lack in 5-star amenities, we make up for with a cozy home and prime location next to the Tahoe Donner Ski Hill! You provide your own sheets and towels. No pets, no smoking, please. In the winter, it can get cold, so bring extra sweaters and blankets, and snuggle up with loved ones! love this property. right across the street from the lodge/mountain. perfect fit for our young family. Location of this condo can't be beat if you are looking to go skiing. The place is fairly well-stocked, but could use a few more mugs and a tea pot. It would be great if sheets and towels were provided. This was a perfect fit for our family of 3! The condo is homey and cozy and had everything we needed for a comfortable stay. I wanted to get my 12 and 11 year old boys on skiis. Tahoe Donner is a very reasonable and affordable ski mountain for beginners. We found David's condo on vrbo and - as advertised - it was perfect for a small family getaway. The ski lift is literally two minutes out the front door. The master bedroom had the most comfortable bed my wife and I have ever slept in. The second bedroom had a great queen size bed that both boys slept in. The downstairs has a well stocked kitchen and cozy living room area with a terrific wood burning fireplace that can literally heat the condo. Very fun area for family movie nights. If you want to eat out, the donner Lodge is a really good value. Good menu and full bar, just 3 minutes driving time. Davids condo comes with an amenity card that gets his guests discounts on lift tickets and other donner amenities. If you want a gourmet meal, truckee and it's upscale venues are about fifteen minutes away. Squaw or north star are about thirty minutes away. We plan to return this summer and enjoy some family golf at the donner golf course - and some good hiking. again, this a perfect spot for a small family escape from the real world. Our five days felt like two weeks ! We will be back. Cozy, comfortable cabin, walking distance to ski lifts even if carrying your skis. Wifi worked great, streamed several movies from Netflix on the Roku provided with no buffering or delays. I don't ski, the wife and kids do, so it was nice for me having a warm quiet place to work/relax while still being close enough to help out if needed carrying skis, boots, whatever. We arrived late at night, in the snow, in a minivan - a bad combination for us. No knock on the cabin or the amenities, but the complex it's located in is tough to navigate at night in the snow - can't see road signs and most of the condos in the complex look identical. Would recommend arriving during the daylight if possible. Property manager was super friendly and helpful, would definitely stay here again if skiing at Tahoe/Donner. Thanks to David for opening his cabin for rental, you got a good thing going on there. Rates subject to change without notice. By law, we are required to assess a 12% tax on all short-term rentals: The Town of Truckee requires that a transit occupancy tax of 10% be assessed on rental and cleaning fees to all rentals of 30 days or less. We must charge you directly and are not allowed to absorb the cost for you or include it as part of our rent. (Truckee Municipal Code 3.24.050). Truckee TOT Reg. No. 443. The Town of Truckee also assesses a 2% tax for the benefit of the Truckee Tourism Business Improvement District (TTBID), which is used to enhance the experience of visitors to the Town of Truckee. If you are renting a unit in Truckee that does NOT charge you this tax, they are out of compliance with the law.